Lost Art Press recently printed an English translation of Grandpa’s Workshop. I bought three copies, one for my son and the other two for two of my nephews. 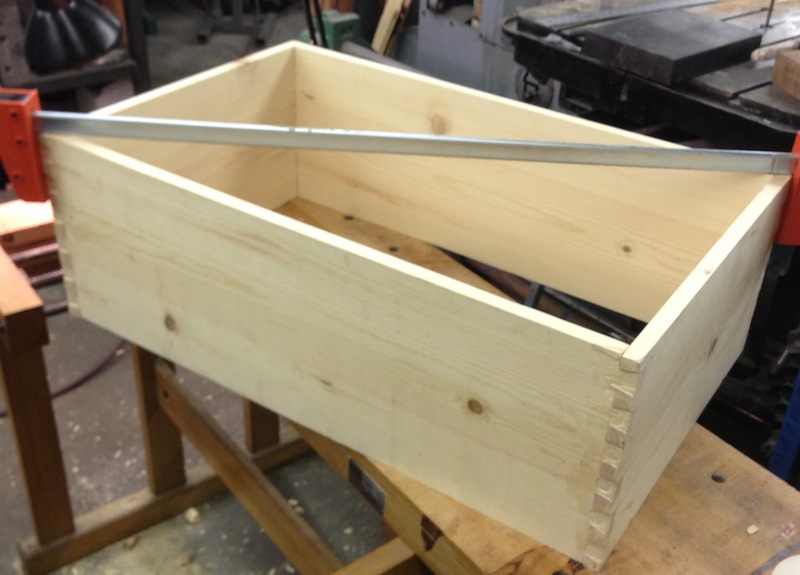 In the book there is a simple tool chest; I was inspired to build a simple tool chest for my brother-in-law for Christmas. Hopefully he’s not secretly reading my blog. The visual I had in mind was another chest inspired by by the same book. This one is built by Archer Burbank, age 6. I like the simplicity and size (of the chest, I don’t actually know Archer, although he looks to be a cute kid). So of course I immediately ignored those two things as I started building one as a Christmas present. I set the size based on one of the standard “golden ratio” sizes (13″ tall x 21″ wide x 34″ long), in part because with a 1 x 12 and an applied bottom and lid I would end up at about 13″ tall. It’s a wonder I get through the day in one piece. So that’s the story of why the chest is so big. 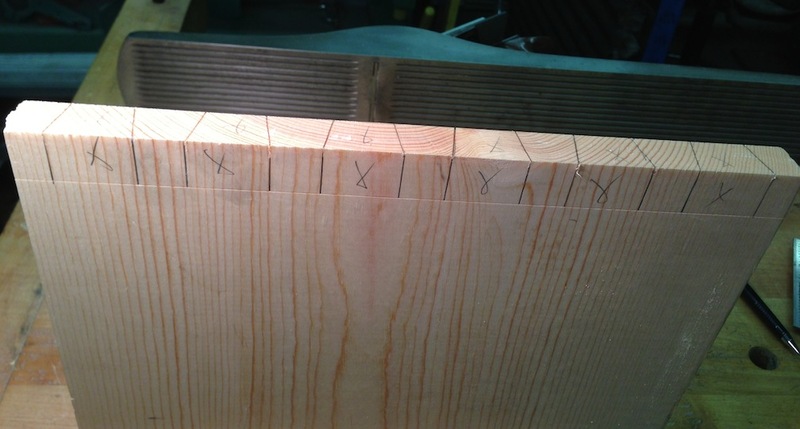 The complex part boils down to wanting the practice dovetailing. If I’d nailed it then I’d be done by now. I tried to work carefully, and timed myself on different parts to get a sense of how long it takes me to cut and fit dovetails. I was cutting tails (or pins) on one end of one board in about 12 minutes. Layout, sawing, chopping. No way it that going to set any records in the Hand Tool Olympics, but my goal was to get the best fit possible. Sawing went just fine, thank you very much. I have plenty of room for improvement, but all of my tail cuts were square and followed the line reasonable well. I haven’t been sawing out the waste, instead I’me chopping right on the baseline and paring away some of the waste for chisel clearance. After sawing my first step is to pare away a small chip in front of the baseline. Then I register the chisel in the baseline and give it a light tap, and repeat paring up to the baseline. At this point I can use a solid hit with the hammer, and I repeat this until I’m about 1/2 way through. Flip the board and repeat on the other side. This seems to work really well for me. 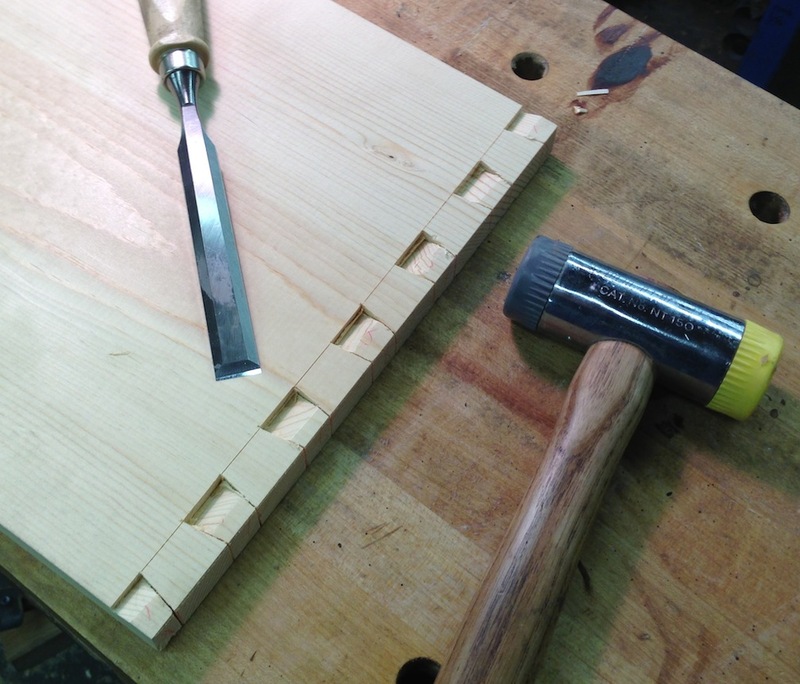 A sharp chisel makes this so much easier. I nicked my finger when I went to brush away a chip and touched the chisel with my left middle finger. I had to stop and grab the masking tape to keep from bleeding everywhere. Transferring the tails to the pin board went really smoothly. No slipping, and I’m still really liking my Cosman dovetail makring knife. I sawed all of the pins next to the layout line, and in a few places was a little wide of the line and could easily pare to the line. I tried to sneak up ion the fit. I probably left it a little too tight as it was a struggle to glue up. Live an learn. 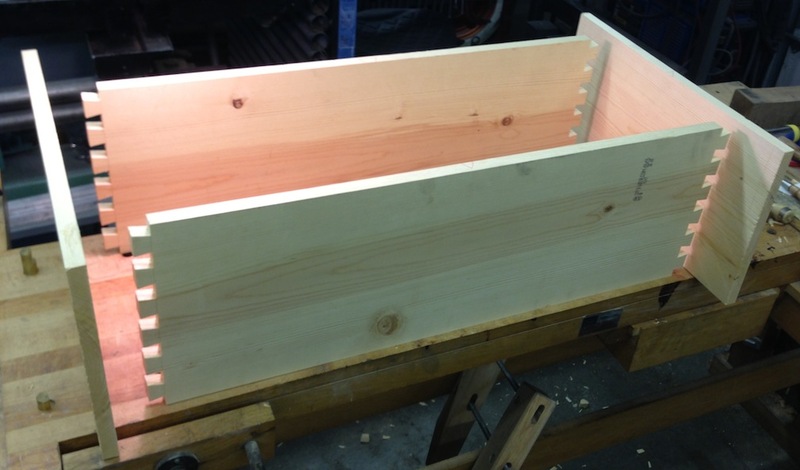 Test Fit – Almost There! Gluing up wasn’t as smooth as cutting and fitting. It was a little rushed and sloppy, I need to work out a better process for that. I’ve since planed up the joints, I have a few gaps at the baseline because the glue set up before I could get everything driven/clamped into position. Nothing terrible though, this is going to be nice! Times a-wasting. I have to nail on the (shiplapped) bottom make the lower skirt, lid and some internal bits. 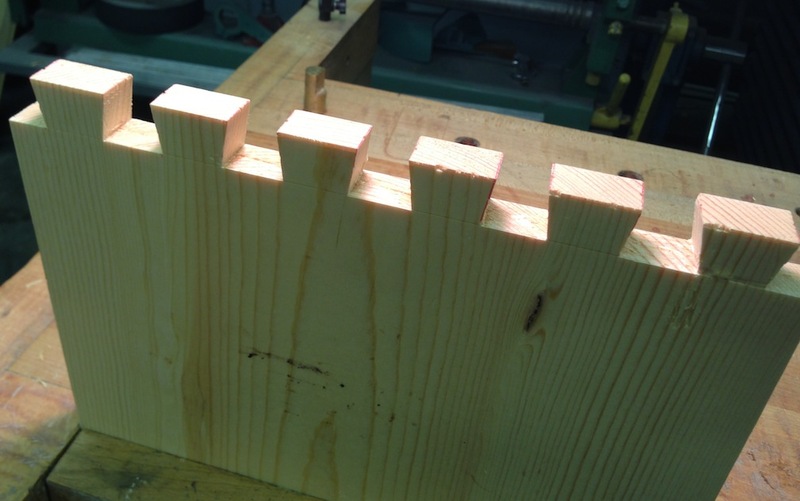 A chisel holder, saw till and sliding till. Or whatever I get done by Saturday night..
oddly enough I just finished working on the case for my sons tool chest as well. I just need hinges to complete it. He’s getting it for his birthday. I went with the 6 board chest style box. 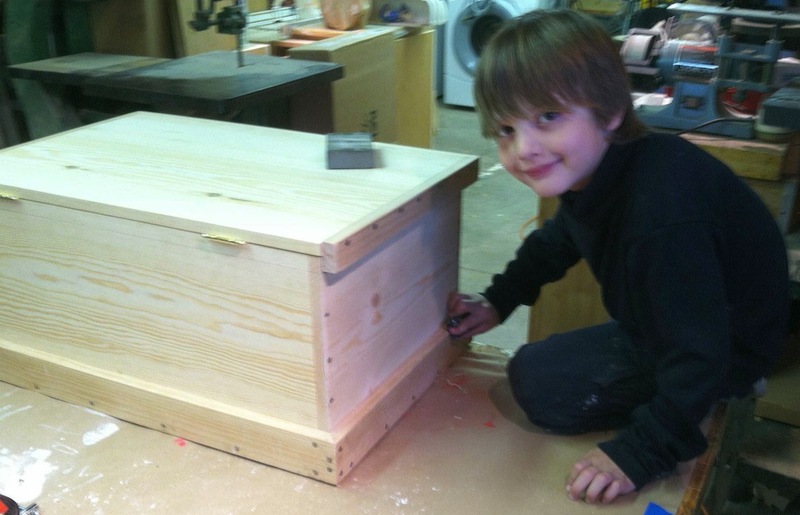 I made a (MUCH SMALLER) tool chest for my son last year, and filled it with interesting tools. It was a simple nail-up job based on one of the “I Can Do That Too” articles in Popular Woodworking. It was a fun project, came out pretty nice for the effort and money. I put a block plane, eggbeater drill, hammer, layout tools, small pull saw and a handful of other things in it. It’s a *great* present for any kid in my opinion, post some pictures of the one you’re making. I’d love to see it. You are the first person I’ve seen that chops out the half pin. I saw mine out with a knife wall for the cross grain cut on top. I might have try your way to compare it to what I do. You noticed! Actually, this is the first time I’ve chopped the half-pins. Usually I do it the traditional way (pare a notch and saw it with the dovetail saw). I was experimenting. It’s slower, but not by much. It saved the step of mounting the board horizontally for each half-pin cut (a possible advantage only because my front vise stinks). I “chopped” from three sides, without clamping. And I ended up with a really nice fit. No real advantage, or disadvantage in my book. 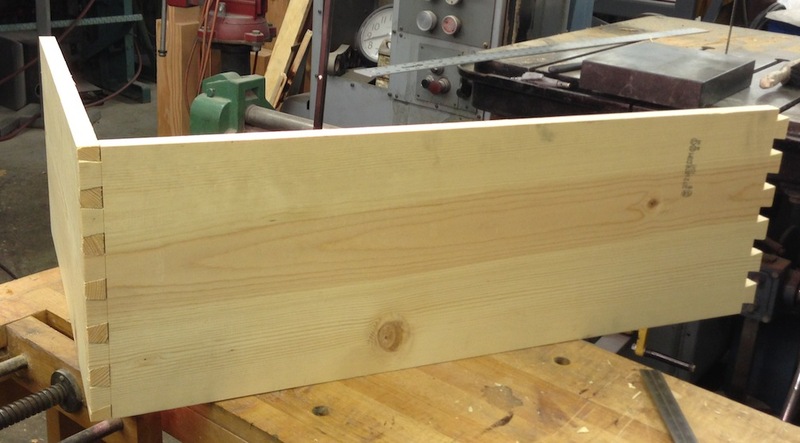 After reading about the glue setting up a little too soon on your dovetail joints, it reminded me of a blog article by Paul Sellers. I don’t know if you’ve read Paul’s blog article on “glue freeze”, but it does offer some suggestions on dealing with it.